As San Diegans smugly stroll around in shorts and sandals while the rest of the nation freezes over, we sometimes lose track of the seasons. The holidays are upon us, though, and there’s no shortage of special holiday events to get festive at. In fact, there are so many festivals and parties around town that it can be hard to decide which ones to go to. Well, stop fretting: here are all the holiday happenings you need to mark on your calendar, all together in one... well, calendar. 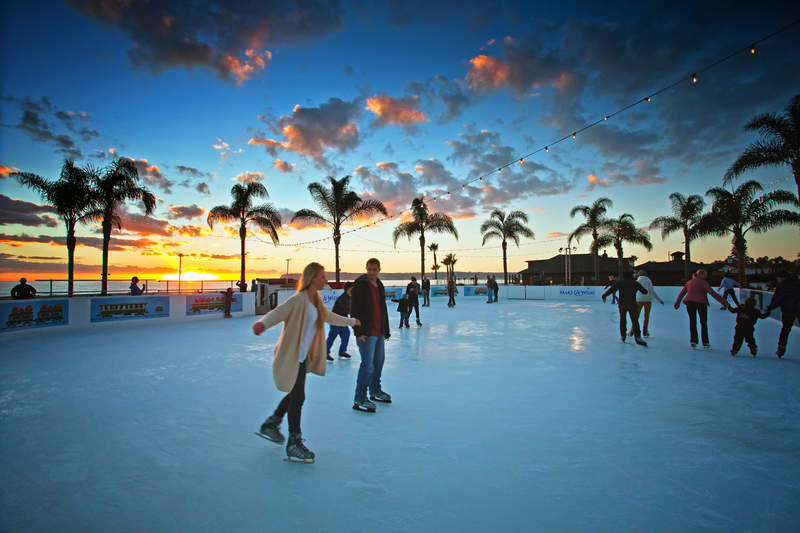 Lace up your skates and hit the ice at Rady Children’s Ice Rink (formerly Fantasy On Ice) in the Arts District at Liberty Station. With 100% of the proceeds going to benefit The Peckham Center for Cancer and Blood Disorders at Rady Children’s Hospital, the annual event has raised more than $1 million over the past 18 years. Skate to your heart’s content, then visit one of Liberty Station’s restaurants and breweries, or the Liberty Public Market for nearly unlimited food and beverage choices. Santa Claus ditches the red suit and sleigh to arrive in San Diego surfer style! Head down to Seaport Village to see the jolly man himself hit town at 1pm near the Pier Café, with a little help from San Diego’s Dragon Boat crew, followed by a meet and greet and photo ops for the kids. Later, he’ll hop into a shiny red convertible for a festive parade down the boardwalk featuring live music, stilt walkers, and holiday cheer. Take advantage of Small Business Saturday and peruse Seaport Village’s 50+ diverse shops to stock up on holiday gifts before enjoying refreshments at one of its many pubs and eateries. San Diego’s iconic crown jewel is transformed into a winter wonderland with thousands of dazzling holiday lights, thanks to December Nights. This free, family-friendly event includes complimentary admission to Balboa Park museums from 5-9 pm, plus live music, dance performances, museum shopping and food from all over the world. Highlights include the International Christmas Festival at the House of Pacific Relations Cottages, and performances by the San Diego Junior Theatre and San Diego Civic Youth Ballet, as well as a wide variety of exhibitions and entertainment in the museums. The eighth annual SoNo Fest & Chili Cook-Off features 40 local restaurants throwing down their best bowls of hot, hearty chili. Get a five taste ticket for $15, or throw in an extra $5 for a beautiful keepsake bowl handmade by the San Diego Ceramic Connection. Wash it down with libations from 22 brewers, cider makers, and vintners in a block-long beverage garden before heading to the two stages presenting local bands, a kids' fest with carnival games and bounce houses, 30 local artisan vendors, and five food trucks. All proceeds benefit McKinley Elementary School's Spanish, Arts, Music and Gardening programs. Deck yourself out in your best Santa outfit and prepare for more holiday cheer than you can handle. The evening begins with a complimentary welcome shot and 50% off drinks, then continues to spread holiday joy at four different bars featuring complimentary cover charges, VIP entry with re-entry privileges, and great drink specials. Whether you’ve been naughty or nice, you’ll still receive a Santa cap and beard at check-in. Rock around the clock at Queen Bee's Art & Cultural Center’s annual Holiday Hop and Rockabilly Dance Party. The evening starts with rockabilly dancing lessons, then the dance floor opens with music from DJ Eric Reedy -- later that night, enjoy performances by The Stilettos, San Diego’s prima ballerina of burlesque Lola Demure, Glitter Tribe Studio students, and Valentina on the Rocks. Awards for best dressed and best ugly holiday sweater will be awarded, and a full bar is available. Halloween isn’t the only holiday for costumes -- yes, you can let your furry, feathered, or scaled friend show off its finery at the 10th annual Gaslamp Holiday Pet Parade. The parade starts on the corner of Fourth Avenue and K Street at the Gaslamp Hilton Park, and features prizes for the best pet, human, and group costumes in nine categories, as well as a pet expo and pet talent show. There’s also free live music, and the first 300 Pet Paraders to register will receive a complimentary goodie bag filled with pet-related product samples and gifts. Beer lovers can celebrate National Ugly Christmas Sweater Day (of course it exists) as the San Diego Model Railroad Museum hosts its third annual Ales n’ Rails Ugly Christmas Sweater Party. Enjoy unlimited tastings from local craft breweries including Mike Hess Brewing, Pizza Port Brewing Company, Benchmark Brewing, and Rock Bottom Brewery, with proceeds helping to fund the museum’s unique exhibits, public programs, and the overall operations. Rohr Park in Bonita brings snowy thrills for the whole family, just 20 minutes from downtown San Diego. Grab a tube and fly through twinkling light archways, decorated trees, and falling snow, or perfect your double axel at the ice skating rink, then check out the Snow Globe Photo Booth and get a photo to remember it all. Ten different party zones, unlimited drinks at 12 bars, a first-class full buffet, and the hottest party bands and DJs make Big Night San Diego the biggest, most indulgent way to ring in the New Year. Wander through the Sapphire Stage & Ballroom, Retro DJ Ballroom (the best of the '80s through dance tunes), Club Dance Ballroom, Indigo Club Room, Urban Dance Zone, and dining areas all in the major rooms. In the VIP area there are more additional zones, VIP Lounges, VIP Club Zone, and Velvet Rope Area. Laugh your way into 2018 at the National Comedy Theatre’s New Year’s Eve Spectacular! The fun improv comedy show, similar to Drew Carey’s Whose Line Is It Anyway?, is based completely on audience suggestions. Also included is a buffet dinner before and after the show and a Champagne toast at midnight, as well as an after-show party with the cast as you count down the seconds to the new year. Tickets must be purchased online and in advance, though, so no walk-ups. 21+ only. Stroll aboard a $25 million dollar yacht and party like a celebrity as you gaze at spectacular 360-degree views of the San Diego skyline. Dance at your own chosen pace with three levels of music, including a hip-hop dance deck, a legendary '80s all-stars cover band, and smooth tunes on the open air upper deck. A huge variety of gourmet appetizers and an open bar all night long keeps the party going -- upgrade to VIP status for early boarding and an extra hour of drinking and mingling on the upper deck. Just bring your 21+ ID, and let the the voyage begin! This is not The Nutcracker ballet your grandma took you to when you were 8. A Culture Shock Nutcracker, inspired by Janet Jackson’s “Rhythm Nation” video, takes Tchaikovsky’s original score and tosses out the jetés and arabesques in favor of hip-hop, tap, contemporary, krump, and popping while referencing everything from Star Wars to Bowie’s Labyrinth. The ultimate mash-up of dance genres and theatrical and musical styles blended with a timeless holiday tradition, the cast of over 100 dancers and club-worthy sound mix will have you grooving in your seats.